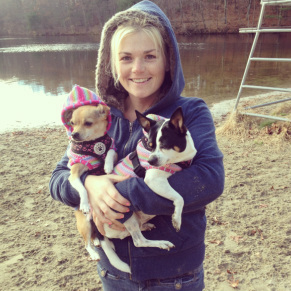 Puff & Fluff was founded in 2013 when local Massachusetts native Amanda Morrell decided to follow her passion and love for animals. Amanda decided to start a pet service business because she knows the importance of proper pet care and she knows how hard it is to find a trust worthy person to care for a family’s four legged family member. She has grown up with having dogs all her life and more recently has started fostering and working with various rescues to help save homeless dogs or unwanted dogs. Amanda also has some experience grooming and training dogs of all breeds and size. She has a genuine compassion for animals, and treats all pets as her own. Meet Penny & Daisy they are Amanda's fur babies and the reason for Puff & Fluffs existence. These girls may be on the smaller side but they are always up for an adventure to the park or on the trails. Penny is a three year old spunky Chihuahua that often has a lot to say but is always up for some fun. Daisy is a six year old Chihuahua that is sweet as can be and loves to go with the flow and wherever her mom goes. Cindy- Recently moved from Virginia to Massachusetts to be closer to her family. She currently does not have any pets but she is the ultimate animal lover. She has owned dogs, cats & horses but currently does not have a pet so she is loving spending time with all of our clients. Tami- I’m a dog lover without a dog, so I get my “dog fix” each day from my time with our clients. Getting to know each of their personalities is always interesting and fun. I feel privileged to take care of your very special four legged family member.